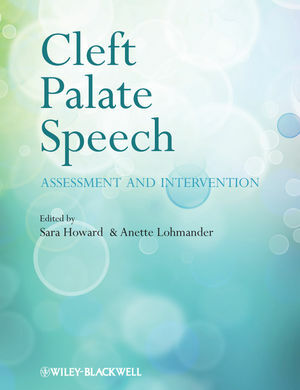 Cleft Palate Speech: Assessment and Intervention Publications, Chichester: Wiley-Blackwell, p221. Six pages on the use of EPG for diagnosis and treatment of cleft palate speech including a description of abnormal EPG patterns seen in this client group. Visual feedback therapy with electropalatography (EPG) for speech sound disorders in children. Interventions in Speech SoundDisorders in Children . Brookes: Baltimore pp. 509-536. 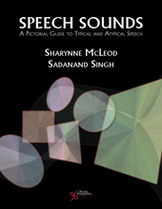 Speech sounds: A pictorial guide to typical and atypical speech. San Diego, CA: Plural Publishing. Each English sound is described and pictured in a photograph, schematic diagram, ultrasound image and EPG frame. Seeing speech: A quick guide to speech sounds. San Diego, CA: Plural Publishing. Each sound is represented on each side of the divided pages. Each side can be 'flipped' independently so any two sounds can be compared. The sound is described together with a photograph, diagram, ultrasound image and EPG frame. 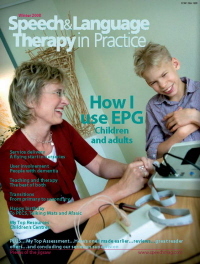 When traditional therapy techniques were not proving effective with two boys who have dysarthria due to dyskinetic cerebral palsy, Ann Nordberg, Elvira Berg, Goran Carlsson and Anette Lohmader offered real-time visual feedback through EPG. Lesley Anne Smith explains how EPG had a small but important impact on articulatory dyspraxia and intelligibility of a patient who had suffered a stroke.